The last in a long line of women sworn to guard our world against evil, jeweller Garet James is struggling to come to terms with who – or what – she really is. Will Hughes, the alluring four-hundred-year-old vampire who tasted her blood and saved her life, could help, but he’s disappeared. Garet believes he’s in France, searching for the Summer Country, the legendary land of the Fey where he might be freed from his vampire curse. Desperate to understand her legacy, Garet follows Will. In Paris, she encounters strange, mythic beings – an ancient botanist metamorphosed into the city’s oldest tree, a gnome who lives beneath the Labyrinth at the Jardin des Plantes, a dryad in the Luxembourg Gardens – meetings that convince her she is on the right path. 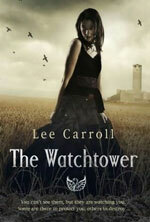 The Watchtower is the second book in Lee Carroll’s urban fantasy Black Swan Rising trilogy. 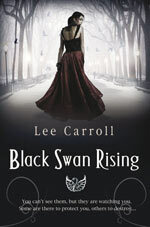 Events in The Watchtower take place shortly after the previous book finished and it’s a direct continuation of the storyline established in Black Swan Rising so it’s necessary to read these books in order. The setting of events in The Watchtower is shifted from New York to Paris. After working together to thwart the plans of the evil alchemist John Dee (stopping the release demons onto the New York streets) Garet’s vampire lover Will Hughes disappears – leaving New York to search for a way to regain his mortality. After a few weeks Garet received a sign that Will might be in Paris, so she goes to France and follows in his footsteps… a journey that takes her through the magical parts of Paris, once again introducing her (and the reader) into a world of subtle fey magic. For the majority of the story the supernatural focus is on a plethora of fey creatures rather than vampires. Will’s part of the story is set in Elizabethan England. The reader is shown Will’s journey to vampirism and immortality as a young man of just nineteen. The chapters of Will’s Elizabethan adventures slow the story’s pacing down from leisurely to glacial. They have none of the immediacy of Garret’s current day adventures and, worse, they highlight Will to be an incredibly vain and feckless young man. It’s hard to have much sympathy for him, or even the original Marguerite, when their star-crossed lover affair is doomed by their own stupidity. The overall effect of these passages is that they act like speed bumps and leave the story very unevenly passed for the majority of the novel. Pacing improves when the two storylines join up again in the lead up to a thrilling finale, so it’s worth the slow slog to get there. Find out more about this book at Carol Goodman’s website. Visit Carol Goodman’s website.